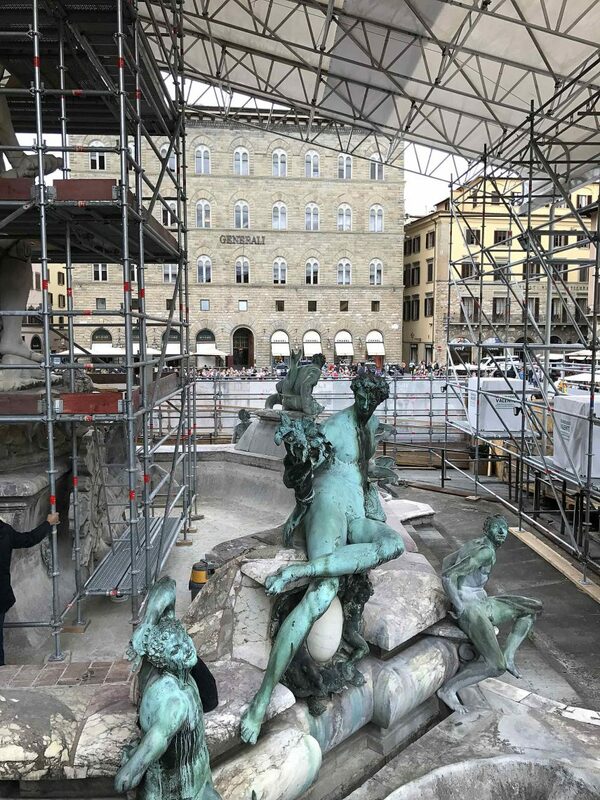 You finally made the long haul to get to Piazza Signoria in Florence, only to find that the Fontana del Nettuno, the masterpiece of a fountain featuring Neptune in center stage, is all caged up for a facelift and all your photos are going to be sectioned off like a crime scene. And it is a crime that you can’t see this mammoth Roman god carved from one huge piece of Carrara marble by Bartolomeo Ammannati! The gem was commissioned in 1565 by Cosimo I de’ Medici, the first Grand Duke of Tuscany. For those of you who don’t know the story, this towering white fountain, sarcastically nicknamed “Biancone” (Big White Giant) by the Florentines, alludes to the city’s acquisition of ports on the Tuscan coast and dominance on the seas. I reserved my place on the government sponsored tour for the 11 am visit with a max of 15 other persons, and met up with an Art History major, who was our guide. We donned our hard hats and entered behind the curtain to meet Neptune. The experience can be rated a pleasant surprise! The tour is easy to schedule into your busy day touring the city, because it only takes about 10 minutes. In addition, our guide was qualified to offer not just a few interesting tidbits about the fountain, the statues and the working that is being done but also spoke just enough English to make it exciting for the curious tourist. 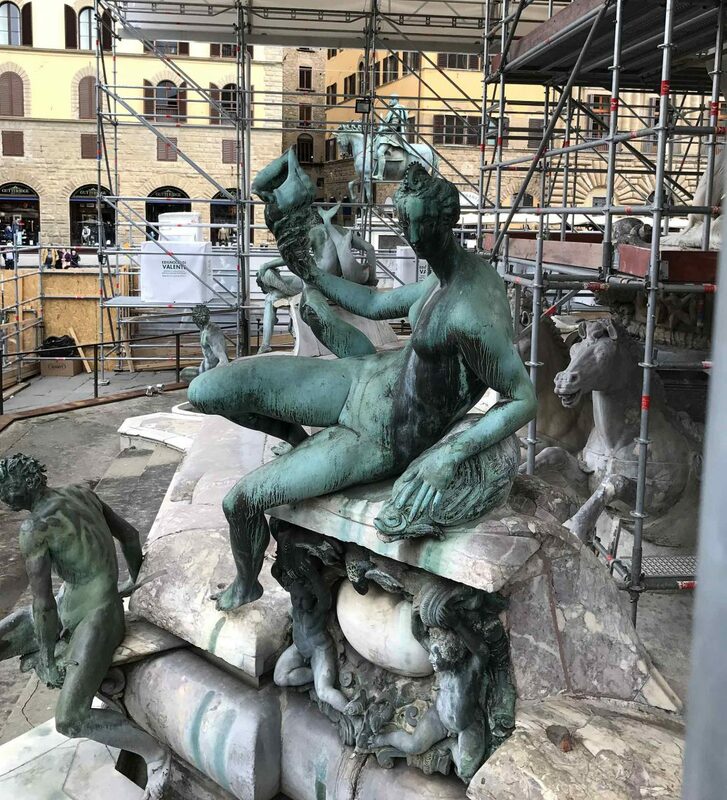 Since February 2017, the Fontana del Nettuno has been undercover for some much needed restoration. 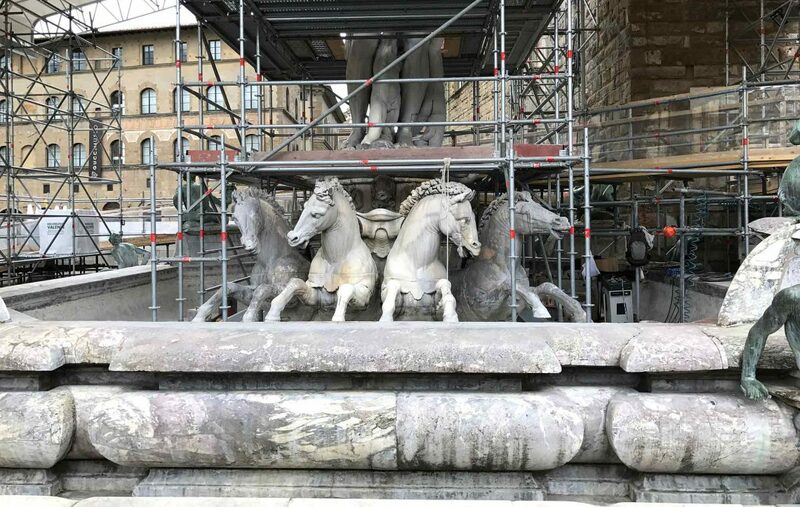 It is amazing but true; just 10 years after the last restoration, you can no longer appreciate the original colors of the marbles, the statues are losing their fingers to frostbite, the inclement weather is taking its toll and the tubes that make the fountain come alive have long rusted out. The restoration process is expected to last until December 2018. 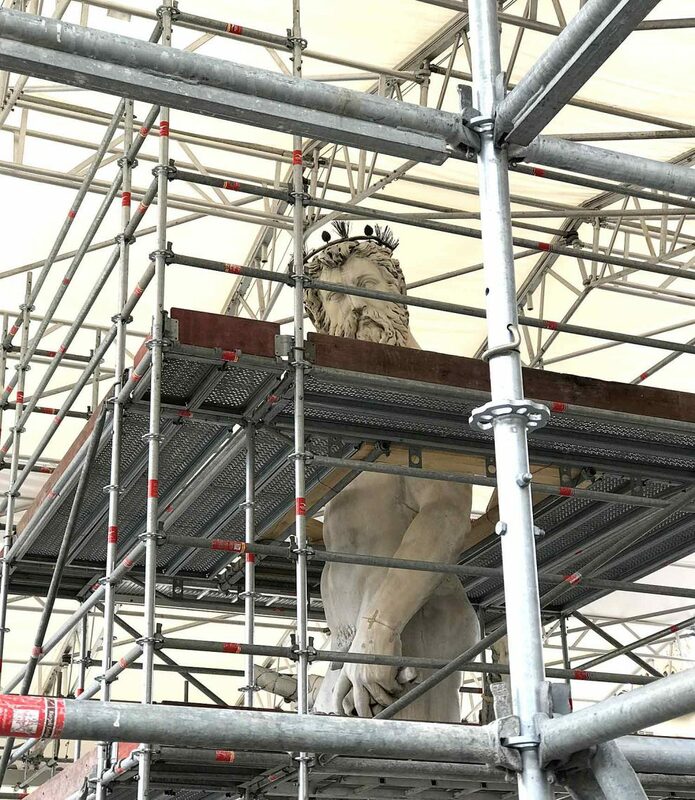 However, even with all the scaffolding covering the marble giant, the octagonal base decorated with bronze river gods, laughing satyrs and the marble sea-horses emerging from the basin, you still have a chance of getting a one of a kind photo. Don’t be disappointed just yet! Starting in May 2017 it is possible to reserve your spot to enter behind the scenes and watch as they polish and shine the fountain back into shape. A visit to the website, and you can do everything online! Up until May 31, 2017 the visit is free, as the restoration progresses there will be new possibilities to visit the fountain made available to the public. Your tour guide will meet you at the entrance, and you can get close-up and on the “other” side of the protective tent which includes a walkway and transparent walls to see Neptune and his entourage while being cleaned up.